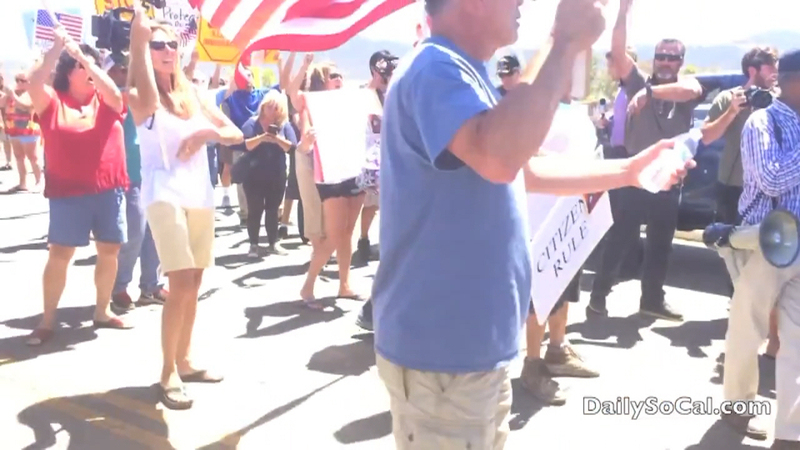 The video below by the Daily Southern Californian, clearly shows how the convoy of buses transporting illegal aliens were stopped by anti-illegal-immigration protesters in Murrieta, California in July, 2014. Raymond Herrera initially stood in front of the Murrieta police vehicle leading the convoy. This brought it to a halt, as shown in the photos below grabbed from the video. Herrera steps to the side when ordered to do so by police, but by that time other protesters have joined and filled the gap. Many protesters helped block the buses. There was a crowd of protesters behind him. It was certainly a group effort. One person could not have done it alone, but Herrera was definitely the one in front, who initially brought the buses to a full stop, which gave others the chance to step up. Raymond Herrera brings caravan of illegal aliens to a dead stop. Pingback: Monthly Protest Report – Impeach Obama NOW! – August, 2015 | Coalition to Impeach Obama NOW!